Today, we bring you a message by Presiding Bishop F. Josephus Johnson, II, better known as Bishop Joey Johnson,. 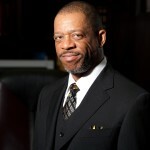 He is the Organizer and Senior Pastor of The House of the Lord in Akron, Ohio. The message was recorded on Wednesday February 24, 2016 during our Seminary Chapel at Ashland Theological Seminary. Bishop Johnson is a renowned Bible Scholar, counselor, educator, conference speaker and workshop facilitator. His experience in leading one of the city’s largest churches for forty-two years has equipped him to impart wisdom for issues related to church growth and development, business management, leadership and team building. Bishop Johnson authored six books, The Church: The Family of Families, God Is Greater Than Family Mess, The Eight Ministries of the Holy Spirit and The Eight Ministries of the Holy Spirit Study Guide and most recently, The Biblical World Through New Glasses and Lord of the Flies: A Leadership Fable. Bishop Johnson is married to Pastor Cathy Johnson. Previous Previous post: Special Podcast: Dr. Marvin McMickle Honors Dr. MLK Jr.
Next Next post: Podcast: The Road to Obedience: Are We Willing to follow Jesus on this road?